This is a relatively simple task to finish your leather bottle or flacket in an accurate, effective manner. Most people simply grab a cork from a modern wine bottle (an unbranded one if they are fussy) and make do with that. But is this an accurate representation or just laziness? The bottle was made on a wooden mould or block, which had a cylindrical projection on which to model the neck. The latter did not project above the seam and only slightly bulged on each side. It was closed with a stopple of metal, wood, horn, or leather, in early times. Some stopples were costly, judging by those bought in 1392 for the Earl of Derby, one of which cost two shillings… Corks for casks and bottles do not seem to have been used till the 17th century. In old prints of that time the bottles and phials, in indoor scenes, are generally closed with bunches of rag or paper. The first corks met with by Professor Thorold Rogers were in 1627. … I have seen three leather bottles which had stopples of leather, but they are rare. So using corks in leather bottles isn’t really the way to go. It seems cork stoppers weren’t imported in large enough numbers to leave a record until the end of the first quarter of the seventeenth century and then were prohibitively expensive, until nearly the end of the century when sufficient economies of scale were created by mass production of glass wine bottles. (Rogers, T., History of Agriculture and Prices in England Vol VI, 1866. pp. 608-9). Here’s some examples of wooden stopples from the Mary Rose and from London. Stopple associated with Mary Rose flacket 81A2218, 1545. Stopple found with Mary Rose costrel 81A2034, 1545. 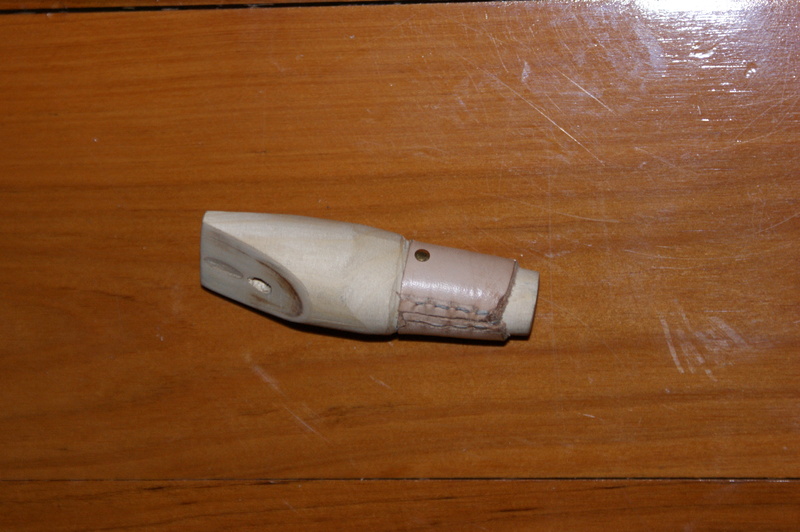 Carved stopper in the Museum of London, l 30mm; field maple. Egan, pp216-217. Some of the Mary Rose ones, associated with both flackets and costrels, have an additional layer of leather to assist with sealing. I’ll assume you don’t want to use rag or paper as suggested by Baker, particularly if you use your bottle in re-enactment on the march, but don’t let me stop you if you do want to give it a try. As this isn’t the Reverend’s Big Blog of Wood, I’ll concentrate on copying one of the leather wrapped Mary Rose stopples from this point on. The first step is to carve the wooden part. Take a branch, stick or offcut of an appropriate timber and remove the bits that don’t look like a stopple with any of cutting, filing, grinding, whittling or other application of brute force until it fits the neck of the bottle in question. If you aren’t going to fit the leather sleeve, congratulations, you have finished. If you are fitting the sleeve, you need to further reduce the diameter of the stopple by the thickness of the leather. How you do it depends on the style you’re doing. Some, like the one I’m doing have a shoulder to help stop the leather slipping up when it’s being jammed in the bottle. Others have the leather sitting proud of the wood. I usually reduce the diameter using files and finish the shoulder with a knife. 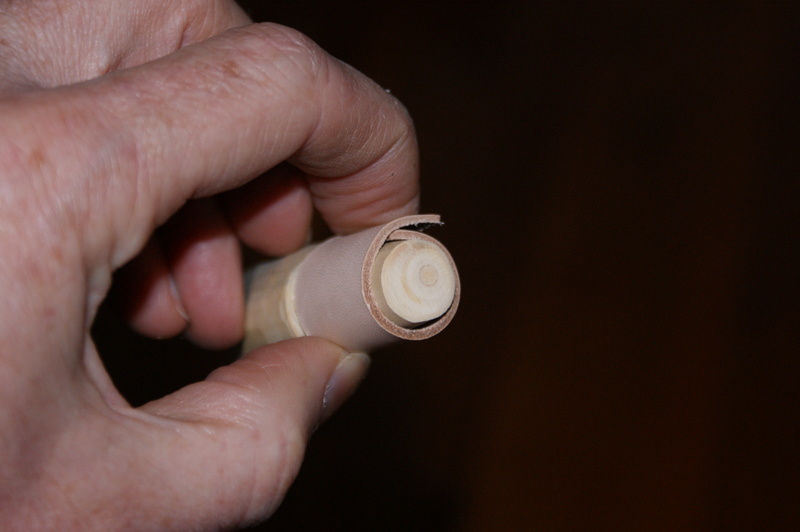 In the photos below, I’m using a bit of field maple from one of my trees in the back yard. It had been a cricket stool leg until the application of brute force by a gorilla rocking back on it snapping the tenon. This is the same timber as the London example, used for it’s ultra-fine closed grain and corresponding dimensional stability when it gets wet. I also like the silvery colour and the hand feel when working it. The tool selection is fairly simple, you can get by with needles, and awl and a knife. I used a groover as well to keep the stitching flush with the surface, but a shallow knife cut would also help the stitches lie flat. 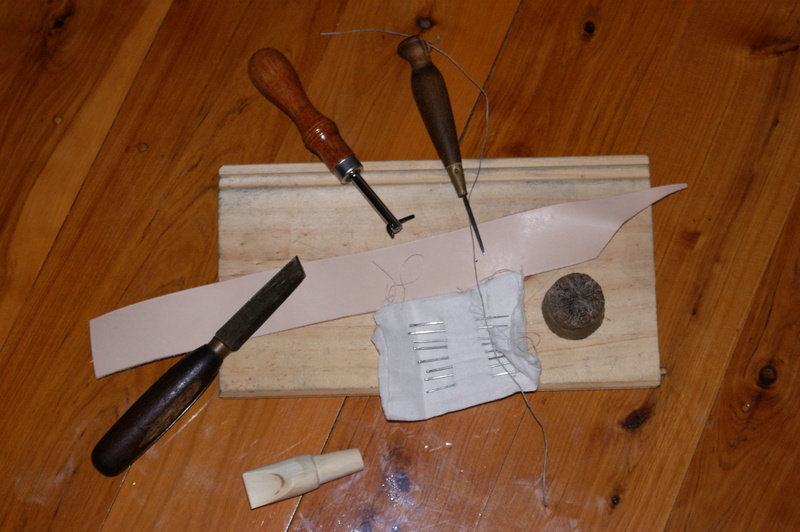 Wrap the leather tightly around the wooden core and then slice through both layers with a single knife cut. This leaves a piece of leather that is an exact fit for the core. You may find you need to stretch the upper side of the rectangle of leather to get it to fit the taper, the extant originals are fairly rough fitting at the top and bottom. Stitch the seam and tie off. I’m using edge – flesh stitches and tieing off with overhand knots in each hole. Once finished, dampen the seam and rub it flat with your prefered slicker. The finished item, with the sleeve pinned in place. I’ve found that often the first time you fit a stopple to your bottle, one or other of the lower corners of the seam turns back on itself – as can be seen in the photo above. I don’t worry too much as it can also be seen in both the archaeological drawings. 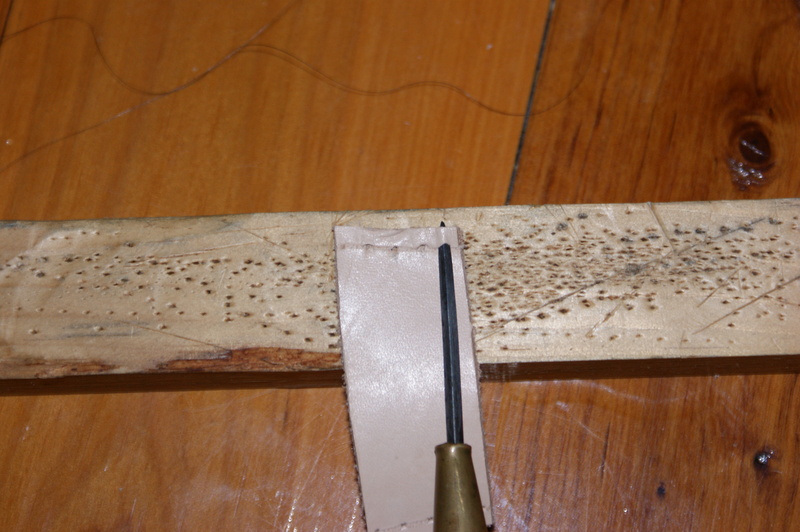 If it is a problem for you, use a little food-safe glue to hold the leather down before stitching. Total time for this including the woodwork was 20 minutes. I used power tools, even with hand tools it should take less than an hour. This entry was posted in Big Book of Leather Chapters, Early Modern, Late Medieval, Leather Vessels and tagged costrel, flacket, flask, leather bottle, London, Mary Rose, stopper, stopple. Bookmark the permalink. Hi Wayne, once again very helpful article! Thought you might be interested: I’ve been experimenting with “gluing” the leather onto the wooden stopple with the same pine pitch I use for waterproofing (for waterproofing I mix it with beeswax though, makes it a little less prone to cracking under the thumbs of all those avid costrel-squishers out there). Seems a plausible solution, especially since the leather on the originals doesn’t seem to have any mechanical means of attachment that I can see. I put in a neck gasket and used pitch to as a hot-melt glue to hold the leather in place while I stitched it. It was much quicker and involved far less bloodshed than I’m used to. That’s a great idea. 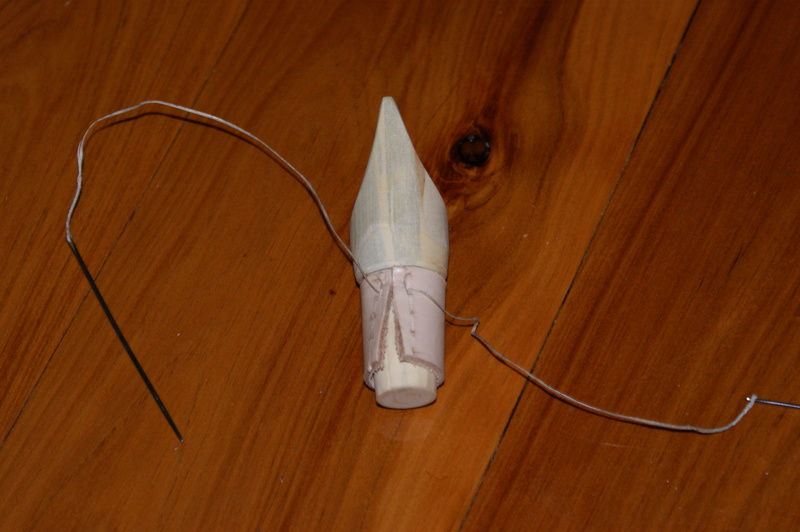 We know they were gluing all sorts of things and it matches the extant finds better than the sewn version.